This interview took place on: 9/7/14. JFH (John DiBiase): Veritas got its start as "Shofar," correct? As an introduction to new listeners, can you tell us a little of how the band come together? 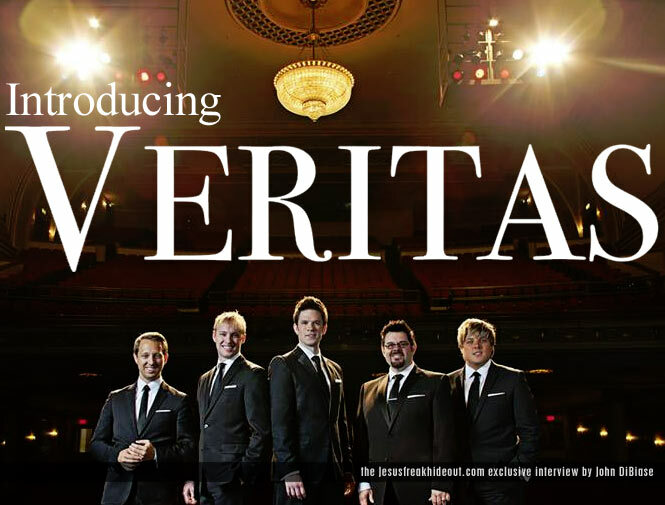 James Berrian: Veritas is a contemporary classical vocal group with five guys who all come from a different musical background. Jeff is a soulful, dramatic tenor who's always singing up in the rafters. Jordan is also a tenor, but has more of a really cool rock edge to his voice. Scott and I both have strong classical backgrounds in opera, and Andrew has a great musical theater voice, which is kind of the glue that holds it all together. Most of us went to college together and toured as a part of the Truth 40th Anniversary tour with Roger Breland. Once that tour was finished we all hit the road full-time as Veritas, and the rest is history. JFH (John): Why the name "Veritas?" James: Veritas means "truth" in Latin. We get to meet people all the time who are searching for love, for hope, and for something to believe in. We have the great opportunity to use the musical gifts we've been given to help make an impact in their lives by sharing with them the truth that they are loved and there is hope in Jesus Christ. James: When I was a kid, I started taking piano lessons. From there, I started playing in the marching band, and did that all through high school. When I was 16, I started to sing and train my voice. We didn't have a choir at our school, so I sang in the choir and did solos at our small, country church. That was when my passion for singing and music really took flight. To think now I get the opportunity to travel full-time with Veritas and sing across the country is a dream come true for me. JFH (John): How did you get connected with Fair Trade Services to release your full-length debut? James: We had been touring for about a year when a friend of ours, Mark Harris of 4Him, introduced our music to the team at Fair Trade Services. One day, as we were driving through "nowheresville" Texas, we got a call from Mark telling us that Jeff Moseley, the president of Fair Trade Services, would like to meet with us. So, we went to Nashville to meet with him and his team. We were excited and a little nervous about meeting him, but the meeting went great! The Fair Trade team is excellent at what they do and have treated us so well. We're really honored and humbled to be a part of the Fair Trade family. JFH (John): You covered some really recognizable songs, but some are vastly different stylistically in their original form -- like Switchfoot's "Dare You To Move." What inspired you to cover it? When did you hear that song and think "Hey, we should do this one!" James: One of the coolest things about the contemporary classical genre is the creative process of taking a familiar song that everyone knows and putting a twist on it. When Fair Trade brought "Dare You To Move" to the table to consider, we immediately knew this was an opportunity to do just that. The vision for this song was always to create a "larger than life" piece that had soaring vocals and a killer orchestra. JFH (John): Favorite song on your album, Veritas? James: My favorite song on the album is "Dare You To Move." It's so out of the box and fun to listen to! JFH (John): What song do you enjoy singing live most? James: I can't help but pinch myself every time we sing "The Lord's Prayer" live. There's something about the arrangement that moves and inspires me. Honestly, it's just a privilege to get to sing it every night. James: One of my all-time favorite singers is David Phelps. The dude can flat out sing. Il Divo, Michael Buble, and Celine Dion are all artists who have inspired me musically over the last few years. JFH (John): What are your tour plans? James: Veritas is currently on tour this fall premiering our debut album. We're also gearing up to do some appearances with Sandi Patty this fall and in the spring of next year. JFH (John): If you could share the stage with or tour with any band or artist (existing today), who would it be? James: I think a dream for us would be to tour with Michael W. Smith. Each of us has such a high level of respect for him as an artist and as someone who creates great music. When we first started, his orchestral albums really inspired us as we were beginning to shape the Veritas sound. James: For me personally, it's been the importance of spiritual discipline in life. 1 Timothy 4:7 says "Train yourself to be godly." My prayer lately has been that God would help me to be disciplined to read his word and do what it says so that the people I come in contact with would be drawn to Jesus. Veritas's latest album, Veritas is available now wherever music is sold!